The Roscoe Guitars Custom series. The instrument you choose should never stand between your ideas and their expression.The Roscoe Custom Series bass guitar brings you the tone and playability to translate your ideal sound into reality, While being as beautiful to look at as it is to hear and play. The Roscoe Custom Series bass guitar is the definition of our craft, proudly produced in our Greensboro, NC, workshop with the finest attention to detail. With the highest level of craftsmanship, and an almost limitless array of options available for you to choose from, you can help us build the bass guitar of your dreams. A long list of fine, highly figured exotic wood carved tops are available, matched with a standard three-piece quarter sawn Maple & Purpleheart neck with graphite reinforcement bars. Various choices for fingerboard woods provide the custom feel you are looking for, and you can choose from custom electronics to suit your needs. 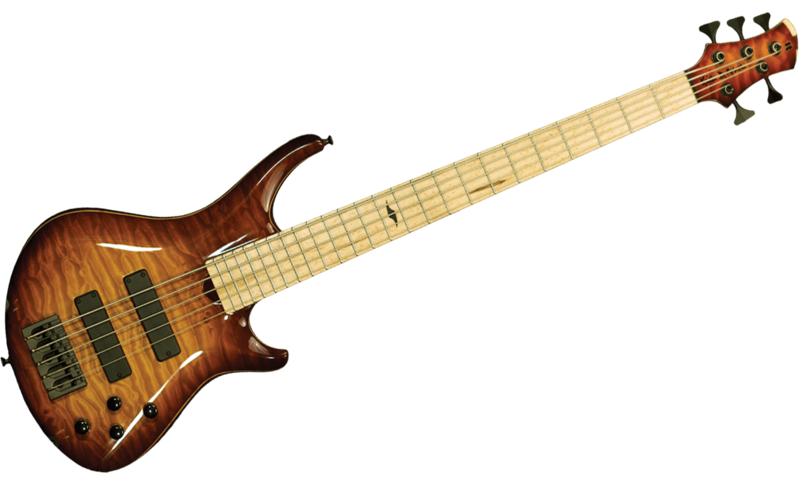 The Rosoce Custom Series bass guitar offers many combinations of options to help you achieve the sound you dream of, at a starting price of $3,750.00.